Laura Geller probably better known in the USA than the UK, is a brand that needs massive praise, if you like the whole full on cake face, this is not the brand for you Laura Geller is subtle, quality and classy, nothing at all like me ! I do have quite a bit from Laura Geller to bring you over the next few weeks, but wanted to start with eyes, I am such a mascara snob it's not even funny, nothing to do with price as I love what works, not what costs most. My first attempt with this mascara was not a success, the brush is incredibly full and bushy, it is especially designed to be soft, oversized and XXL and I found it quite overwhelming on first attempt, I asked one of my Grandaughters to try it out for me, and she instantly loved it ! 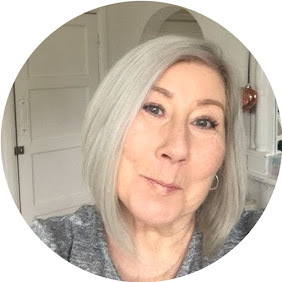 not one to be beaten by a wand, I gave it another go, and totally fell in love, it gave me both volume and longer lashes, I could have got away with one coat, but did two and the result is here for you to see, and with vitamin B5 for conditioning, I love it ! My next trial was the Inkcredible Waterproof Gel Liner, in Blackbird. I love a twist up pencil, hate sharpening. My first test of this was on the back of my hand ( as you do ) OMG it did NOT want to wipe off, a good sign to start. It is a soft easy to use pencil that glides easily on the lid, let me just point out here I am not an eye liner queen, but this was really easy to use, I also tested it as a khol and it worked perfectly on the water line, it stood up to a day's shopping and well into the evening, with no panda eyes either, this little tube of magic has a hidden secret with an invisible sharpener in the base to ensure precision lining. Some things are nice to try, and sometimes products become staples, these are definitely on the staples list.